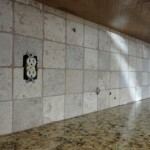 Grouting a kitchen backsplash is one thing. Connecting it to the countertop is quite another. 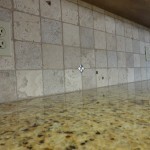 After grouting and cleaning up the tiled splash there should be a very narrow open joint between the tile and the countertop material. 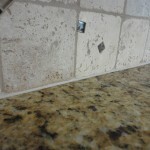 That joint must be filled with a flexible material so that when the backsplash and countertop move independently of one another (and they will) the joint between them will not crack out and make a mess. Grout won’t do that for you. It has to be caulking. 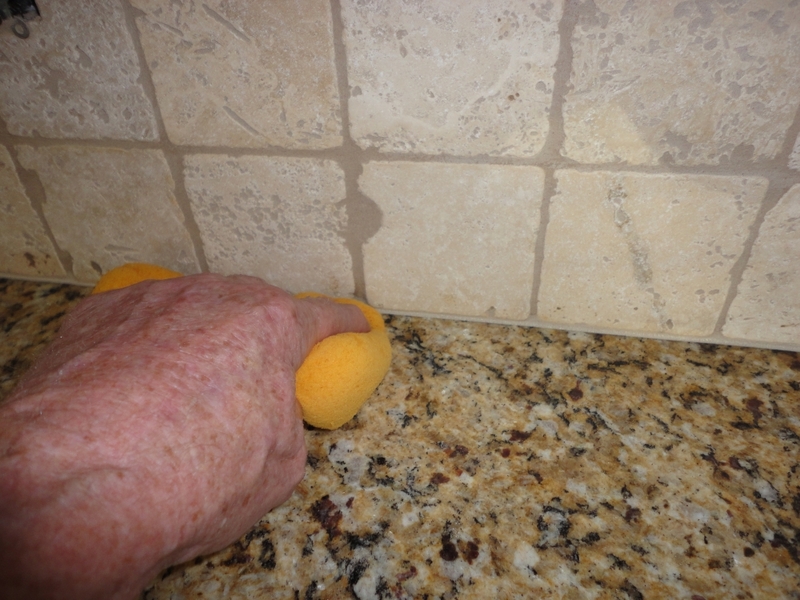 For my demonstration I’ve chosen a backsplash installation done with tumbled marble tiles, but every tile splash will be caulked no matter the type of tile used. For this particular splash I chose a sanded caulking made by Custom Building Products and sold at Home Depot. 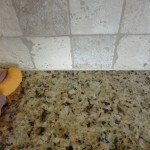 It matches the color of the sanded grout that was used on the splash, and it is a latex product that cleans up with water. 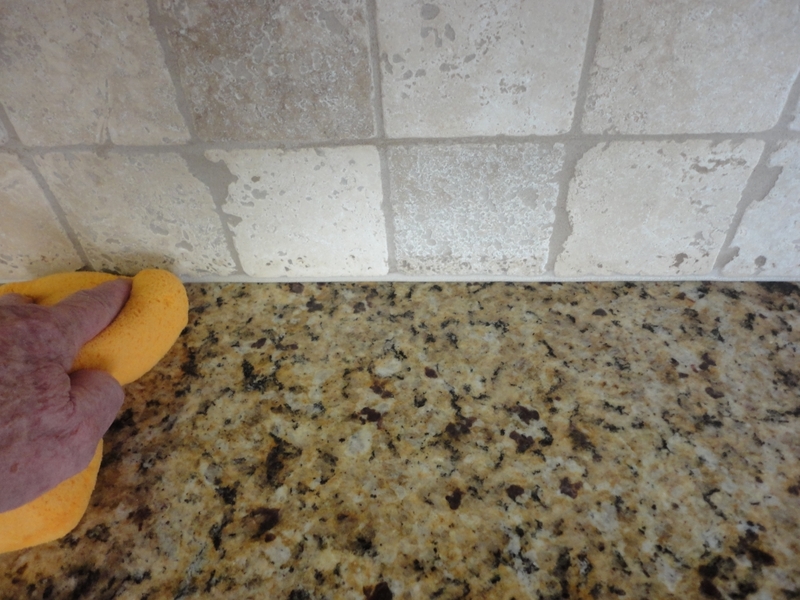 While grout gets lighter as it dries, caulking gets darker, so you won’t see the final result until the day after grouting and caulking. It is hoped that when dry the two materials will come together, as it were, where color and shade are concerned. The grouting has been completed and allowed to partially (or totally) dry. You’ll want the joint about to be caulked to be completely dry. Otherwise, the caulking will not stick to the two surfaces. 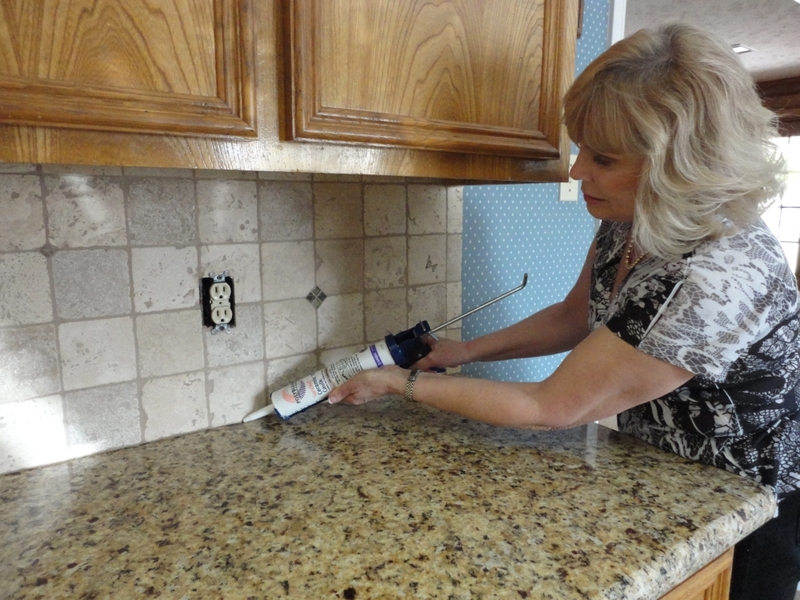 A caulking gun is used to inject the grout into the joint. The object is to install enough caulking to completely fill the joint without over-filling and making a mess. When the joint has been filled, begin wiping it with a sponge that has been tightly wrung out. Wipe in one direction. After each pass the sponge is rinsed and wrung again. You don’t want excess water in the joint. 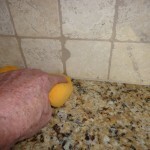 Too much water will ruin the caulking, so make sure you wring that sponge tightly. It will take a number of passes with the sponge. Remember to rinse it after each pass, or you’ll simply smear the grout around. One pass, one rinse. 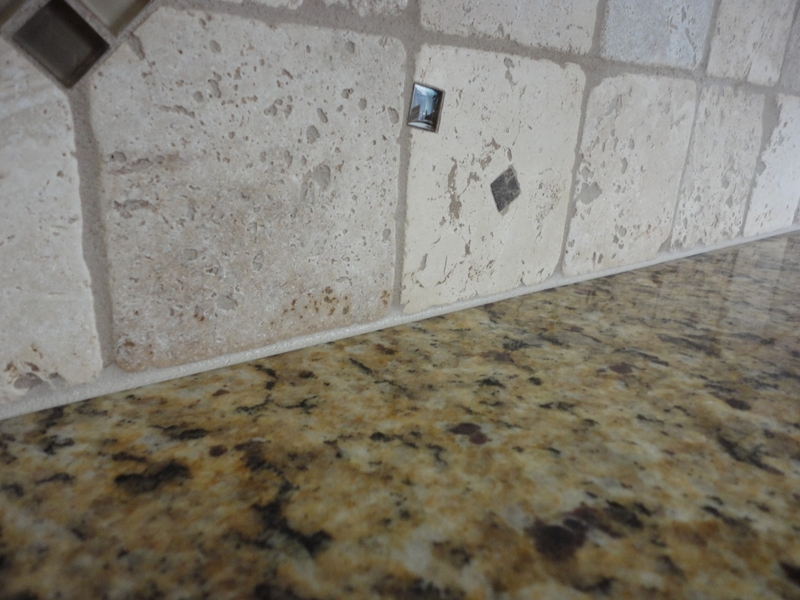 When you see the joint smooth out and notice that all excess caulking has been removed from both the splash and the countertop — the joint looks good in other words — it’s time to stop. Continued wiping will remove more material, and you want to leave the joint as full as possible. As I mentioned previously, the caulking will appear much lighter than the grout until it dries, which will probably take overnight. 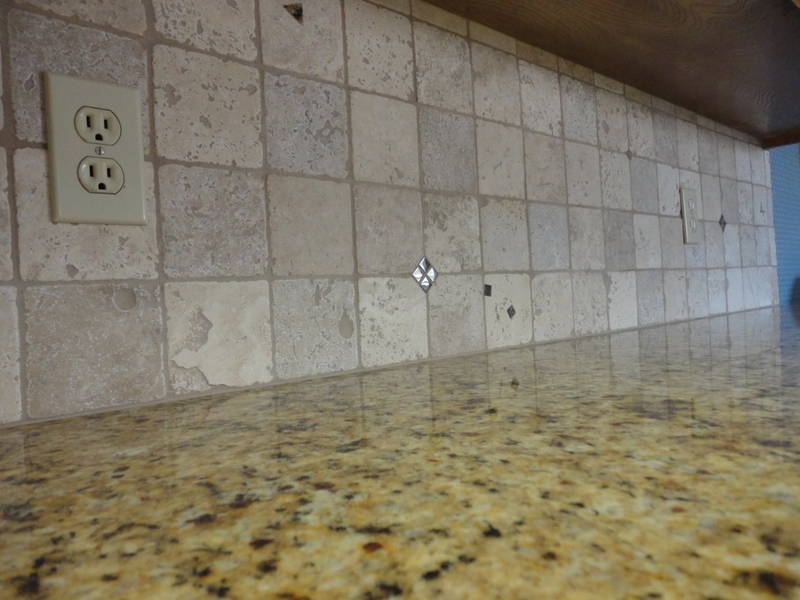 Just make sure that the entire joint is eye-pleasing and that there is no caulking on any of the surfaces. Another place to use caulking instead of grout is where a tile surround joins a bathtub deck. In that case, though, you must use a silicone caulk that is not water soluble. 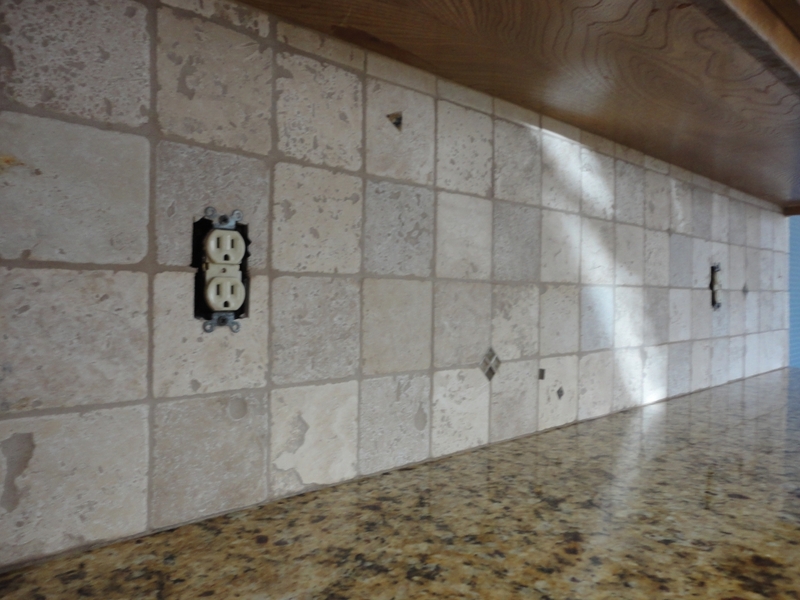 If you have questions about caulking or anything having to do with tile or stone you can get ready answers at the John Bridge Tile Advice Forums.